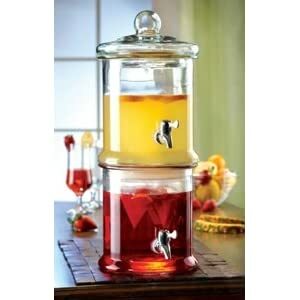 *HOT DEAL* Double Stacked Glass Beverage Dispenser Over 50% Off! This is PERFECT for all those summer bbq’s! Amazon is offering this Double Stacked Beverage Dispenser for ONLY $25! That’s over 50% off!! It’s not the fanciest beverage dispenser you will ever find – but I personally have this – only in a single dispenser – and it works JUST fine! My kids have used it for their lemonade stand, and I have used it at several bridal and baby showers. At this *smoking hot* price – it’s worth every penny!! The price listed above was as of 10:45am CST on June 11th, 2012. Prices and availability subject to change. Make sure you confirm the purchase price prior to purchase.